If you’re jonesing for a Jamey Johnson fix since it’s been so long since we’ve heard from the songwriter, you can get a healthy dose on the new song from Johnson’s running buddy and band member Chris Hennessee. 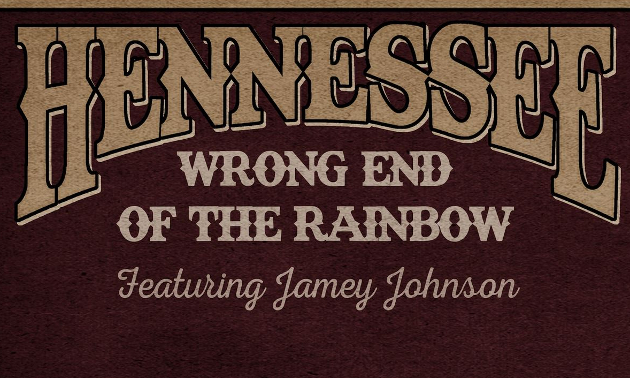 He just released a brand new track with Jamey Johnson guesting called “Wrong End of the Rainbow,” and in the parlance of the youth of our time, it’s a banger. “Wrong End of the Rainbow” is a bad luck song if there ever was one, but the fortune is good for those thirsty for true country music and the twang of “Cowboy” Eddie Long’s steel guitar. Jamey and Chris trade of verses and then come together to sing what’s a rousing track for such depressing subject matter. Hennessee first joined Jamey Johnson’s band in 2012, and since then has also opened shows for Johnson on a regular basis. He will also be playing with Johnson and others as part of the house band for the Country Music Hall of Fame’s opening concert for their Outlaws and Armadillos exhibit May 25th. More info on Chris Hennessee’s new album when it comes available, and hopefully “Wrong End of the Rainbow” gives Johnson a taste for recording new music himself. I love this track and look forward to the new album. “Greetings From Hennessee” is one of my favorite albums of the last few years. Check out Bryan James’ “Between the Devil and the Angel” album. Sounds very much like Jamey Johnson. Just hoping Jamey puts out some stuff soon. He used to be my favorite singer out there. Cowboy is one of my favorite pedal steelers out there. One of the few funky steel players out there. Chris is one of the most talented fellows out there today. The title track Ramble is one of the most beautiful songs I have ever heard. Just hoping and prating he gets the airplay and recognition he deserves! The new album is great. There’s a neat cover on there that turned out good. Wait until you hear it.